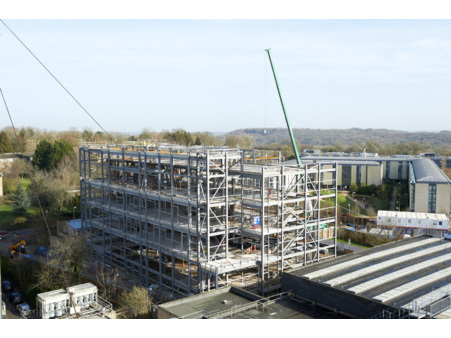 Oranmore Precast Ltd have been selected by Vinci Construction in conjunction with CBS Precast to supply the precast floors for the new Chancellors’ Building which is to offer a dramatic new hub of learning and teaching on Bath University campus. Oranmore Precast Ltd have been selected due to the soffit quality of their hollowcore precast which is to be left up to 70% exposed with a painted finish. It includes facilities ranging from twin 350-seat lecture theatres to 30-seat group lecture rooms with state of the art audio visual provision. The 8,000m2 building doubles the number of large scale lecture theatres on campus and up to 2,000 students can use the building at any one time. 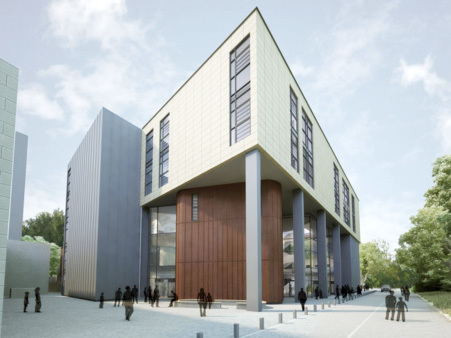 The main entrance to the building faces the campus public transport arrivals area and the 350-seat refectory that forms part of the proposed new student accommodation building.